NVIDIA’s Ty McKercher and Google’s Viacheslav Kovalevskyi and Gonzalo Gasca Meza jointly authored a post on using the new the RAPIDS VM Image for Google Cloud Platform. Following is a short summary. For the full post, please see the full Google article. If you’re a data scientist, researcher, engineer, or developer using pandas, Dask, scikit-learn, or Spark on CPUs and want to speed up your end-to-end pipeline through scale, look no further. Google Cloud’s set of Deep Learning Virtual Machine (VM) images now include an experimental image with RAPIDS, NVIDIA’s open source and Python-based GPU-accelerated data processing and machine learning libraries that are a key part of NVIDIA’s larger collection of CUDA-X AI accelerated software. CUDA-X AI is the collection of NVIDIA’s GPU acceleration libraries to accelerate deep learning, machine learning, and data analysis. The Deep Learning Virtual Machine images comprise a set of Debian 9-based Compute Engine virtual machine disk images optimized for data science and machine learning tasks. All images include common machine learning (deep learning, specifically) frameworks and tools installed from first boot and can be used out of the box on instances with GPUs to accelerate your data processing tasks. This post uses a Deep Learning VM which includes GPU-accelerated RAPIDS libraries. 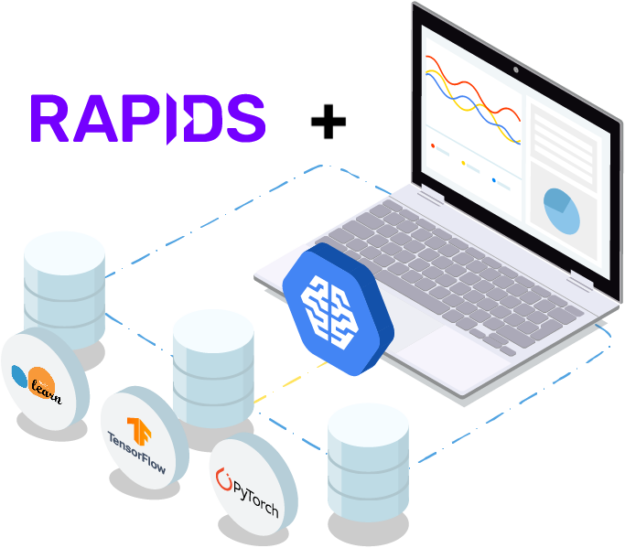 RAPIDS is an open-source suite of data processing and machine learning libraries, developed by NVIDIA I, that enables GPU-acceleration for data science workflows. RAPIDS relies on NVIDIA’s CUDA language, allowing users to leverage GPU processing and high-bandwidth GPU memory through user-friendly Python interfaces. It includes the DataFrame API based on Apache Arrow data structures called cuDF, which will be familiar to users of pandas. It also includes cuML, a growing library of GPU-accelerated ML algorithms that will be familiar to users of scikit-learn. Together, these libraries provide an accelerated solution for ML practitioners to use requiring only minimal code changes and no new tools to learn. You can find the code to run these tests, based on this example blog, GPU Dask Arrays, below. Array size: 2.00 TB. Computing parallel sum . . . Array size: 2.00 TB. Computing parallel sum . . .
You can also run this test in a distributed environment. You can find more details on setting up multiple Compute Engine instances in the Google Post. It’s also easy to deploy on Google’s Compute Engine distributed environment. If you’re eager to learn more, check out the RAPIDS project and open-source community website, the introductory article on the NVIDIA Developer Blog, the NVIDIA data science page, or review the RAPIDS VM Image documentation.